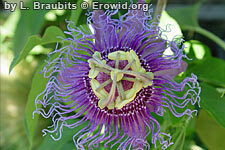 Passion Flower is a woody vine with intricate blue, purple, red, or white flowers. Several species, which act as sedatives and anxiolytics, are consumed as a tea or herbal supplement. Some Passion Flower species may contain small amounts of MAOIs, potentially interacting with other chemicals and medications. And some species, notably P. caerulea, also contain poisonous cyanogenic glycoside. Slight But Worth It, by ?? ?